I was looking at a two dollar coin the other day and remembered that it was once a pound note. As a pound note it was much coveted, held in high regard and usually spent wisely. It bought a huge array of goods when it was in vogue. Today, organisations staging events will often ask for a gold coin donation and we’ll throw a two dollar coin into a plastic bucket without so much as a by your leave. It’s the same with the term ‘a million dollars.’ Once a figure we could barely contemplate, now thrown around with gay abandon - and it rolls off our tongue with ease. We talk about budget deficits in the billions in this country, and in America the term is trillions. To get a handle on just how big a million is, it’s worth recalling that a million days have not yet passed since the birth of Christ. Inflation was once an abomination; back in 1980 it was at 17 per cent. Fortunately successive governments have managed to get it under control. Conventional wisdom says the cause of inflation is too much money chasing too few goods. We currently have the exact opposite situation in this country; hence inflation is at an all-time low. However last week the scaremongering media announced that inflation was creeping upwardly and to demoralise us even further went on to suggest that the Governor of the Reserve bank would likely have to raise the official cash rate triggering a rise in interest rates. Unnerving information for those struggling to pay off mortgages. The news item cited rising house prices, rental increases and petrol price-hikes, but did concede that inflation was still below the rate that triggers Reserve Bank action. I was surprised that petrol was in the mix; not long ago it was well over $2 a litre, but is now hovering around $1.89. But then the beleaguered government added fuel to the fire when it agreed to increase the hourly rate of health care workers in its employ from $15.75 to $23. 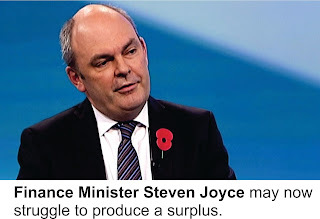 This was said to be going to cost two billion dollars which will dramatically reduce any surpluses Mr Joyce might have hoped to announce in next month’s budget. I would imagine tax cuts are also now off the menu. No one would deny that these health-care workers deserve to be well-remunerated, though I’m not aware that was any shortage of candidates for the jobs. However the flow-on effect is likely to be swift and inflationary with the lower-paid all queuing up. I’m sure most employers will want to pay their staff more, but in a competitive environment this is not always achievable. Anecdotal evidence would suggest that many of the institutions caring for the elderly are struggling financially and wage increases for staff, no matter how well-deserved, will no doubt mean that those families already paying a high price for elderly relatives to be looked after will be asked to contribute even more. Oops, I just dropped a two dollar coin down behind my computer. I don’t think I’ll even bother looking for it. Are we failing our mentally impaired?